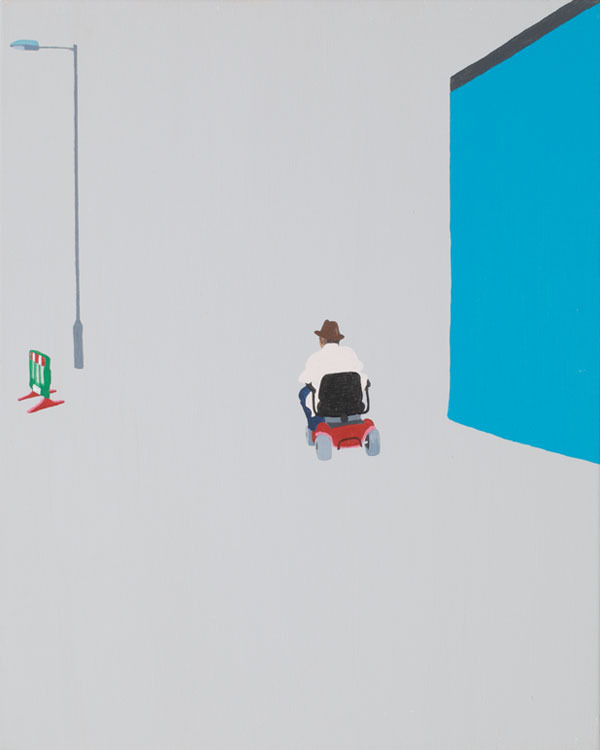 Gwen Yip's painting series, Backs, powerfully illustrates the quiet loneliness that characterizes living in a bustling metropolis. In each painting we see the backs of one or two people in minimally rendered city spaces. That the figures never return our gaze shows that they are not aware of their own visibility. It is a condition of quasi-invisibility with which city dwellers are intimately familiar— one that exists alongside willful exhibitionism and a total surveillance state. Backs is a testament to goodbyes, isolation, and the dissonance of feeling estranged at home. One piece from Backs (NYC) is dominated by the darkness of an unlit parking garage level while a woman in a pink skirt makes her way across a sliver of light in the middle. The way she's walking out of the composition signals a departure, as if she's the last to leave her office building. The right angles and primary colors could easily be a 21st century riff on Mondrian, but Yip is getting at something deeper here than an art historical reference. Backs (Hong Kong) features noticeably more children than NYC or London. In one piece, a young child stands hand in hand with a gray headed man, his other hand on his hip. They stare patiently at the long receding strip of gray road, presumably waiting for a bus. It's a quiet painting dominated by a gray void and punctuated by a triangle of primaries formed by the yellow road stripe and the child's red backpack and blue jeans. It is both a snapshot of life raising a family and a metaphor for the patience it requires. In Backs (London), above, we see a dayglow-yellow vested man in one of the city's liminal spaces doing work that is typically unseen. Unlike other compositions in Backs, this space is constricted by walls, giving a sense of being trapped. For anyone who's spent time toiling away at menial work to make ends meet in cities with skyrocketing rents, that feeling of being trapped ought to be familiar.